In ISO 8601 the associated time would be written as 2019-02-07T23:28:34+01:00. ^ "Europe Time Zone Globe". TimeTemperature.com. Retrieved 14 July 2012. Équateur was one of the eleven provinces of the Democratic Republic of the Congo between 1966 and 2015, when it was split into the new, smaller Équateur province, as well as the Tshuapa, Mongala, Nord-Ubangi and Sud-Ubangi provinces. 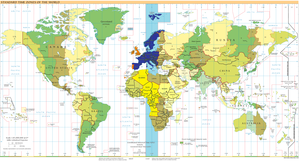 Central European Time (CET), used in most parts of Europe and a few North African countries, is a standard time which is 1 hour ahead of Coordinated Universal Time (UTC). The time offset from UTC can be written as UTC+01:00. The same standard time, UTC+01:00, is also known as Middle European Time and under other names like Berlin Time, Warsaw Time and Romance Standard Time (RST), Paris Time or Rome Time. This is a list of the UTC time offsets, showing the difference in hours and minutes from Coordinated Universal Time (UTC), from the westernmost (−12:00) to the easternmost (+14:00). 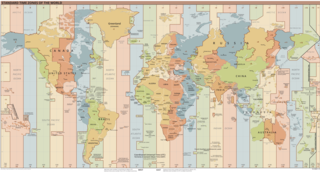 It includes countries and regions that observe them during standard time or year-round. European Summer Time is the variation of standard clock time that is applied in most European countries in the period between spring and autumn, during which clocks are advanced by one hour from the time observed in the rest of the year, in order to make the most efficient use of seasonal daylight. It corresponds to the notion and practice of daylight saving time to be found in many other parts of the world. Central European Summer Time (CEST), sometime referred also as Central European Daylight Time (CEDT), is the standard clock time observed during the period of summer daylight-saving in those European countries which observe Central European Time (UTC+01:00) during the other part of the year. It corresponds to UTC+02:00, which makes it the same as Central Africa Time, South African Standard Time and Kaliningrad Time in Russia. UTC−03:00 is a time offset that subtracts 3 hours from Coordinated Universal Time (UTC). UTC−02:00 is a time offset that subtracts 2 hours from Coordinated Universal Time (UTC). UTC+08:00 is an identifier for a time offset from UTC of +08:00. In ISO 8601 the associated time would be written as 2019-02-07T23:28:34+08:00. Coordinated Universal Time (UTC), the basis for the world's civil time. West Africa Time, or WAT, is a time zone used in west-central Africa; with countries west of Benin instead using Greenwich Mean Time. 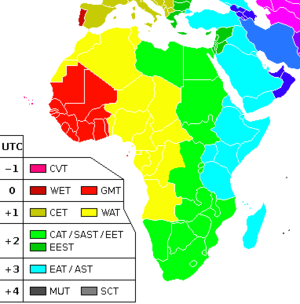 West Africa Time is one hour ahead of Coordinated Universal Time (UTC+01), which makes it the same as Central European Time (CET) during winter, or Western European Summer Time (WEST) and British Summer Time (BST) during the summer. Europe spans seven primary time zones, excluding summer time offsets. Most European countries use summer time and harmonise their summer time adjustments; see Summer time in Europe for details. Canary Islands, Ceuta and Melilla – From the last Sunday in March to the last Sunday in October. Madeira – From the last Sunday in March to the last Sunday in October. Morocco – From the first Sunday in Shawwal to the last Sunday in Sha'ban. Spain has two time zones and observes daylight saving time. Spain mainly uses Central European Time (GMT+01:00) and Central European Summer Time (GMT+02:00) in Peninsular Spain, the Balearic Islands, Ceuta, Melilla and plazas de soberanía. In the Canary Islands, the time zone is Western European Time (GMT±00:00) and Western European Summer Time (GMT+01:00). Daylight saving time is observed from the last Sunday in March to the last Sunday in October throughout Spain. Denmark, including the dependencies Faroe Islands and Greenland, uses six different time zones.